England mounted a stunning comeback to come from two goals behind to beat world champions Germany. 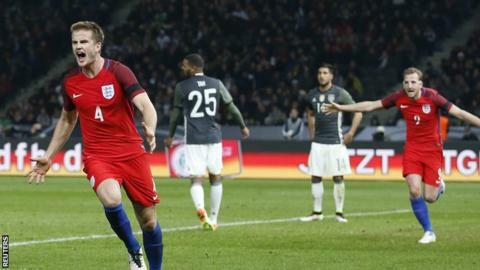 Dele Alli starred on a memorable night in Berlin as Harry Kane, Jamie Vardy and Eric Dier scored England's goals. Sad night for a good goalkeeper - carrying an injury before making his mistake for Toni Kroos' goal. Excellent going forward but still questions to answer defensively. Superb cross for Vardy's goal. Part of an uncertain looking central defence but did better than Gary Cahill. Had a mixed season for Chelsea and was flawed here. Looks uncertain against the highest class and was caught out for Mario Gomez's goal, getting exposed by Emre Can's cross. Not a bad England debut and did not do his Euro 2016 chances any harm. With no standout candidates at left-back deserves another opportunity. Another who has put his name firmly into Hodgson's plans for Euro 2016. Very solid in central midfield without being spectacular and capped it all with that towering injury-time header that gave England an outstanding victory. Hard to see how he will flourish for England against elite opposition. Hard working but real impact minimal. Another who was on the periphery. Talented player but did nothing to suggest he would be a starter in France when Hodgson's serious shake-up is complete. England's best player and lived up to the pre-match hype comparing him to former England captain Bryan Robson. Contributed in all areas and could have had a goal but was thwarted twice by Germany keeper Manuel Neuer. His fine performance was marred with a bad late miss. Trusted by Hodgson and back in the starting line-up for the first time in a year after injury. Worked hard in the wide positions and set up a couple of chances. Back in the fold. Excellent all-round performance from the Spurs striker. Worked hard, linked well and scored with clinical efficiency. A Euro 2016 starter. Did well to turn away Marco Reus' free-kick and could do nothing about Gomez's goal. What an impact. Brilliant flick brought England level and set up Alli for a chance he should have scored. One or two nice touches but little time to make a serious impact.